This DIY Coaster Set features four fun designs that are cut out of Cricut Premium Vinyl using the Cricut Explore Air 2 Special Edition, Martha Stewart Bundle, which is available exclusively at Michaels. The pretty, pearlized Cricut Martha Machine comes with 25 exclusive Martha Stewart images, plus thousands of images in Design Space. For this project I used the MS pineapple, a flamingo, a palm tree, and a hibiscus, but you can totally mix and match the designs however your little heart desires! Since it's stinking hot outside and our cold drinks are likely to sweat, using a water-resistant vinyl is a must. Cricut's new Premium Permanent Vinyl is up for the challenge! It is water resistant for up to five years, and repels the cup sweat like a champ! Another thing that's really cool about Cricut's Premium Permanent Vinyl is that the carrier sheet (the paper backing on the vinyl) lies flat as it unrolls, which makes it super easy to apply! It drives me bonkers when a carrier sheet curls and I have to fight with it to line it up evenly! Open the project in Design Space and click "Make It" at the bottom of the screen. The project will be divided onto mats by color. Apply each color of vinyl to a standard grip mat, then follow the prompts on the screen to cut out the designs. Be sure to set the Smart Dial to "Custom" and choose "Premium Vinyl" as the material. In the "Pressure" drop-down menu, select "more." (I've found that the extra pressure on this vinyl makes it a bit easier to weed). Once all of the cuts are made, use scissors to cut out the pieces by project. Registration squares are on each piece to use as a guideline for lining up the layers in the correct place. Be sure to include the registration mark with each element when you cut the pieces out with the scissors. Use the weeding tool to remove the negative vinyl. Apply transfer tape. Begin adding the vinyl to the tiles. To avoid air bubbles use the scraper tool to help guide the vinyl onto the tile. If you happen to get air bubbles, the adhesive on the vinyl allows for repositioning, so simply lift a corner of the layer to release the air bubbles, then lay back down, using the scraper as a guide. Layer the registration marks on top of each other to ensure proper placement of each layer. Peel away the transfer tape and remove the registration squares. Press firmly all over the vinyl to make sure it is adhered well. Next up, you'll want to add a thin layer of cork to the bottom of the coasters to prevent them from scratching any table surfaces. 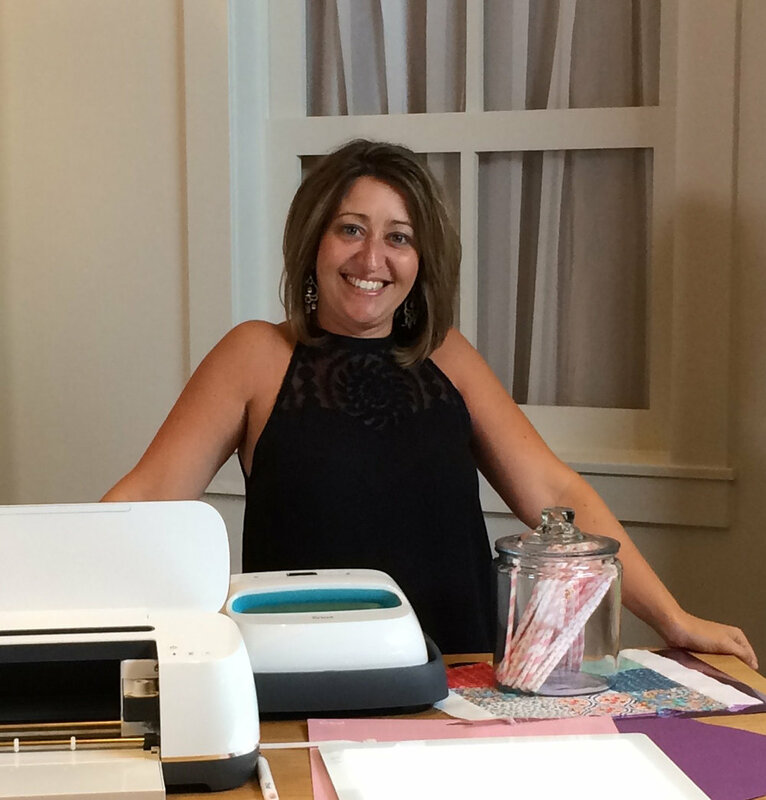 Instead of trying to cut precise squares with scissors, let the Cricut Martha Machine do the cutting for you! This awesome machine can cut over 100 different materials, and this thin cork happens to be one of them. So cool! Simply create a 4-inch square in Design Space and duplicate until you have as many squares as you want to cut. Set your Smart Dial to "Custom," and from the materials list, choose "Cork, Adhesive Backed." Apply the cork adhesive-liner-side-down onto a strong grip mat, and cut away! Once all of your squares are cut, remove the adhesive backing and apply the cork to the coasters. I hope you've been inspired to create some fun DIY Tile Coasters of your own. If you do happen to make them, remember to share a pic on social media and tag me so I can see! Thanks for visiting, and see ya next time. Cheers!! !